Body language is an essential part of human interaction, since we communicate through body language, whether implicitly or explicitly. It is part of non-verbal communication and implicitly reveals intentions and attitudes for those people who can read them. Body language plays a pronounced role in the charisma of men and women, and being able to use it consciously and having knowledge about its expressiveness can serve as a great advantage. 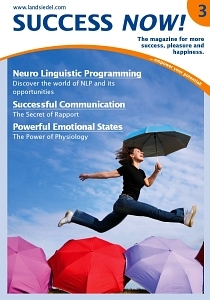 Therefore, it is desirable to learn NLP and thus gain knowledge about non-verbal communication. In the following text, body language is explained in more detail and made clearer by means of examples. Typical behaviors and their expressiveness will be highlighted and explained, including where they come from and why they are demonstrated. Body language includes all forms of gestures, postures and body movements - from the handshake to sitting position and posture, positioning of arms, legs and feet, playing with hands, fingers and objects, head posture and the different forms of eye contact, as well as distance behavior. The following table shows a representative example for important regions of body language in order to provide a first exemplary introduction to the interpretation of body language. Subsequently, other succinct actions are interpreted and explained by describing human behaviors as revealed by the body from top to bottom. The most obvious form of body language takes place at the head, more precisely in the face, facial expressions. Typical and familiar facial expressions are furrowed forehead or raising eyebrows. The latter suggests surprise or a kind of contempt. The lips convey non-verbal meaning. In the attitude of the corners of the mouth, whether they are pulled up in a smile or fall sadly, can indicate the state of mind of an inattentive person, but these facial features can be better controlled consciously. Unconscious, and therefore uncontrollable since they result from a kind of biofeedback, are dry lips. A moistening of the lips is therefore to be interpreted as a sign of nervousness or excitement. From the point of view of evolution, the neck is considered a vulnerable body part and therefore reveals much about one’s state of mind, whether one feels comfort or discomfort. When a person covers his neck by pulling the head back and chin in, or by placing their hands to their necks, it can be considered as a protective reflex or expression of discomfort. If the person shows exposes the neck, e.g., by tilting the head, it suggests that he feels comfortable in the situation, or trusts his counterpart. The shoulders and torso are responsible for body posture. It is generally well known that: an upright posture, with shoulders back, outstretched chest and a straight trunk, is considered a sign of confidence. The opposite does not always mean that a person does not have self-esteem, because for reasons of comfort, a more contracted posture is often taken when sitting in one place for a longer period of time. In general, however, an upright posture seems stronger and presents a more positive appearance. The hands are not only important for reading body language because of their gestures, but also because how and where they are held, if there is no obvious interaction, betray much about a person. One of the first lessons of giving presentations is gesturing. All that is said should be supported by gestures. This clarifies the intention and underlines the importance of the delivered message. Also, the use of gestures is perceived as pleasing to the listener, as it makes a lecture more vivid and thus easier to follow. However, it important not only what the speaker does with his hands while he is speaking, but also while he is silent. Hidden, folded hands radiate uncertainty and discomfort. An open, spread hand posture, such as the “Merkel diamond” (fingertips pressed together, thumbs opposite and pressed together), expresses confidence. This hand gesture can be useful in a negotiation, for example, since it radiates security and makes the other person feel more comfortable. The legs can also say a lot about comfort or discomfort when sitting. When a person is nervous, for example in a job interview, this can be indicated by restless legs. This is revealed, inter alia, by the fact that the legs slightly rock or swing, or the position of the legs is often changed. The feet are considered the most honest part of the human body. From the positioning of the feet, a person will often reveal his intentions. When both feet point at the other person in a conversation, this means that the person is paying close attention to the other and is interested in the conversation. In contrast, pointing one or both feet to the door means that the person wants to end the conversation. Also, affection can be revealed by the feet. So, when couples “foot” each other, it suggests that the relationship is intact and romantic. Signs of affection are explained in more detail below. The belief that men and women have completely different body language is a mistake. Body language is universal and differs between individuals but not overall between a man and a woman. Due to gender roles, men and women do show different behaviors, but the body language signals remain the same. The small differences that exist will be discussed in the following section. This section details how men and women show each other their affection and how to interpret well known signals. A basic rule in flirting says: Whatever you feel, they feel. Our body has a pronounced network of so-called mirror neurons. This means that when we see how someone performs some action, the same neurons fire as if we were doing the action ourselves. Thus, it is to be assumed that the other person in a flirt feels similarly. Basically flirting involves the concepts of comfort and discomfort revealed in the specific reactions as already described. When the other person feels comfortable, he also shows this when flirting through typical expressions. However, in flirting one must differentiate between a man and a woman. Women tend to show interest in playful, comfortable gestures, such as playing with the hair or biting the lip. Men, however, show not only obvious signs of comfort, but also signs that can be confused with discomfort, as they can show signs of nervousness when strongly attracted to a woman. Finally, in addition to the concept of comfort, there are two other signals that are to be interpreted as clear signs of affection: strong eye contact and, as described in the previous section, the feet of the other person. Lying is often associated with body language, because our eye movement and the interaction of facial expressions and gestures can tell our counterpart if we are telling a lie or speaking the truth. That is why reading the body language of a liar is so interesting. It should first be noted that lying often happens in the context of an uncomfortable situation, such as when under questioning, and thus the person feels stress and discomfort. These signs of stress and nervousness are identical to the typical behaviors that occur when lying. This makes it all the more difficult to expose a liar and involves the risk of falsely accusing a human being of lying. Therefore, it is important to put the suspected liar in a pleasant, comfortable mood before interrogation in order to keep the conflicting stress variables as low as possible. In addition, it should be noted that there are hardly any universal behaviors of liars. Rather, they can vary between people. However, there are still a few factors that can indicate for a lie. Avoiding eye contact and frequent blinking can mean that the suspected liar is afraid to be unmasked by prolonged eye contact. A fixed look or rolling the eyes are not typical behaviors that result from mere stress or nervousness but are rather a sign of discomfort. As far as general body language is concerned, attention should be paid to the implicit response to the questions. If limbs suddenly cease moving after a question, this may mean that the interviewee feels caught. Also, scratching, redness of the face and an exaggerated facial expression may be evidence that he has something to hide. Despite all these indications and many more that are expressed in other non-verbal channels, there is no universal miracle method for exposing liars. Here, tact and empathy are needed to get the truth out of another person. Body language is a broad topic in which people in many areas have conducted research. An awareness of what gesture can produce which effect can provide a person with many benefits, not just on the job or in a partnership, but in all areas of life. Improving body language not only makes people seem more self-confident and likeable, it also helps them to feel better intrinsically.